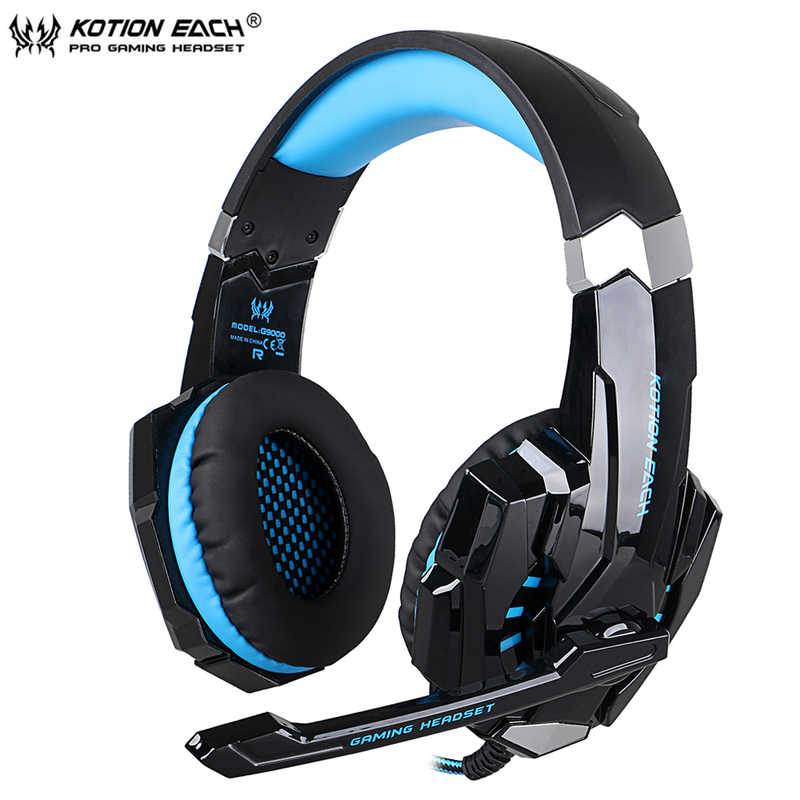 Overview: This KOTION EACH G9000 is a primary kind of gaming headset, which brings you vivid sound field, sound clarity, sound shock feeling, capable of various games. Its super soft Over-ear pads is more comfortable for long time wear, and it is a great headphone for game player! Features: High precision 40mm driver, bring you vivid sound field, sound clarity, sound shock feeling, capable of various games. Splendid ambient noise isolation. 3.5mm connector, it is suitable for iPhone 6 / 6 Plus, Samsung S5, S4, LG, Xiaomi, iPad, PC, laptop, tablet, etc. Earmuffs used with skin-friendly leather material, and super soft Over-ear pads that is more comfortable for long time wear. Glaring LED lights are designed on the earcups, highlighting the atmosphere of the game. Braided wire, durable tensile effectively reduce the external resistance; Velcro cable tie, prevent the line twining. Line is equipped with a rotary volume controller, one key Mic mute, more convenient to use. Exquisite craftsmanship and fashion appearance. Professional gaming headset for your choice. Specifications: Model: KOTION EACH G9000 Driver diameter: 40mm Impedance: 32Ohm Sensitivity: 105dB +/- 3dB at 1KHz Frequency range: 15Hz-20KHz Mic dimension: 6.0 * 5.0mm Mic sensitivity: -38dB +/- 3dB Mic impedance: 2.2kohm LED working voltage: DC5V +/- 5% Headset interface: 3.5mm + USB (USB for LED light) Cable length: Approx. 2.2m / 7.22ft Color: Black-red, Black-blue Headphone size: Approx. 20 * 9 * 21.5cm / 7.9 * 3.5 * 8.5in Headphone weight: 330g / 11.6oz Package size: 22 * 9.7 * 23.6cm / 8.7 * 3.8 * 9.3in Package weight: 538g / 1.17Lbs Package content: 1 * KOTION EACH G9000 Headphone 1.We accept Alipay, West Union, TT. All major credit cards are accepted through secure payment processor ESCROW. 2.Payment must be made within 3 days of order. 3.If you can\’t checkout immediately after auction close, please wait for a few minutes and retry Payments must be completed within 3 days. 1. WORLDWIDE SHIPPING. (Except some countries and APO/FPO) 2. Orders processed timely after the payment verification. 3. We only ship to confirmed order addresses.Your order address MUST MATCH your Shipping address. 4. The images shown are not the actual item and are for your reference only. 5. SERVICE TRANSIT TIME is provided by the carrier and excludes weekends and holidays. Transit times may vary, particularly during the holiday season. 6. If you have not received your shipment within 30 days from payment, please contact us. We will track the shipment and get back to you as soon as possible with a reply. Our goal is customer satisfaction! 7. Due to stock status and time differences, we will choose to ship your item from our first available warehouse for fast delivery. 1. You have 7 days to contact us and 30 days to return it from the date it was received. If this item is in your possession more than 7 days, it is considered used and WE WILL NOT ISSUE YOU A REFUND OR REPLACEMENT. There are NO EXCEPTIONS! Shipping cost is bear by both seller and buyer in half. 2. All returned items MUST BE in the original packaging and you MUST PROVIDE us with the shipping tracking number, specific reason for the return, and your po#. 3. We will refund YOUR FULL WINNING BID AMOUNT, upon receipt of the item in its original condition and packaging with all components and accessories included, AFTER BOTH Buyer and Seller cancel the transaction from aliexpress. OR, you may choose to have a replacement. 4. We will bear all the shipping cost if the product(s) is (are) not as advertised. 1. 12 months Manufacturer`s limited Warranty for defective items (excluding items damaged and/or misused after receipt). Accessories come with a 3-month warranty. 2. Defective items MUST BE reported and returned within the warranty period (and in the original packaging, if possible). You must tell us what the defect is and give us your order number. WE DO NOT REPAIR OR REPLACE ITEMS WITH AN EXPIRED WARRANTY. 3. You agree to all of the above-listed policies upon ordering on Aliexpress! We maintain high standards of excellence and strive for 100% customer satisfaction! Feedback is very important We request that you contact us immediately BEFORE you give us neutral or negative feedback, so that we can satisfactorily address your concerns. It is impossible to address issues if we do not know about them!